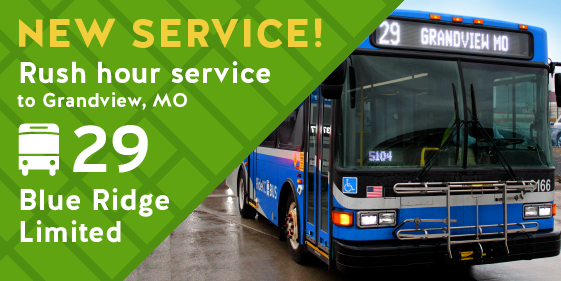 RideKC welcomed the City of Grandview to the regional transit system at a kickoff event for the start of new service extending into Grandview on Monday, April 1, 2019. Kansas City Area Transportation Authority (KCATA) CEO Robbie Makinen, KCATA Board Vice-Chair David Bower and Grandview Mayor Leonard Jones attended the official “opening day” of the 29 Blue Ridge Limited, which extends service into Grandview as part of a pilot program. The extension runs northbound to Downtown Kansas City and southbound to Grandview twice a day, Monday through Friday in the early morning and late afternoon. Buses run every 30 minutes. Grandview Public Works Director Dennis Randolph applied for the $250,000 grant that will fund the extended route for three years. “In building a sustainable community we need to provide for a variety of means of transportation, which is exactly what we’re doing,” explains Randolph. Grandview destinations include Truman’s Marketplace, Mid-Continent Public Library and City Hall. You can find out more at www.ridekc.com.